10 Reasons to Hire a Georgia Speeding & Traffic Ticket Attorney! Pleading guilty to a Georgia Traffic Ticket and paying the fine online should not be a driver's only course of action to resolve a traffic citation. There are several good reasons why a driver should first consider hiring a Georgia Speeding & Traffic Attorney to represent them in court. An attorney understands what your legal options are and can help negotiate a reduction in charges and fines. Protect your driving record and explore your options before pleading guilty to a traffic ticket in Georgia. 1. Customer service: Nothing is more frustrating than leaving a voicemail or sending an email and waiting for days to receive a response. Or worse, not receiving a response at all. A. Bishop Law monitors voicemail and email continuously throughout the day. If we do not answer the phone on your first call, rest assured your call will be returned shortly. 2. Local representation: You want an attorney who knows the area and is in court often. If your attorney is not local to the area, they probably have never been to the courthouse you are scheduled to appear. We are familiar with the courts of Northeast Georgia, know how to get there and know who to talk to when we arrive. Courts we serve regularly: Hall County (Gainesville, Oakwood, Flowery Branch), Jackson County (Jefferson), White County (Cleveland, Helen), Lumpkin County (Dahlonega), Gwinnett County (Lawrenceville), Dawson County (Dawsonville) and all of Northeast Georgia. 3. Job protection: Everyone is looking for the best possible outcome on their case. However, it is especially important to someone whose job depends on it. We understand how stressful a traffic ticket can be and how that might affect a person’s career. If your livelihood depends on your motor vehicle report, be proactive and contact us as soon as possible. 4. Knowledge: Every case is different. We do not sugar coat your case and are up front on what you should anticipate happening with your ticket. We work hard to achieve the best possible outcome in your case by speaking with the prosecution and if needed, the officer who wrote the citation. It is important to have someone on your side, with knowledge of the legal system and what legal arguments can be brought forward on your behalf. 5. Cost: Compared to an increase in insurance premiums, or the financial hardship of losing a job, hiring a lawyer to represent you on your speeding ticket can be far less damaging to your bank account. 6. Time: Taking an entire day off work to deal with a speeding ticket could cost someone a lot more than the traffic ticket fine. There are circumstances where the court may allow your attorney to represent you on your behalf without you appearing. Even if you do have to appear, many times attorney cases are taken first. Our attorneys will let you know, depending on your specific case, if appearing is an option or not. 7. Under 21: If you are under 21, it is important to know that a traffic citation could potentially lead to a loss of driving privileges. Before paying a fine and accepting a guilty plea, it is especially important to consult with an attorney. If faced with a license suspension, we fight to help you obtain a reduction in charges and, hopefully, keep your license. 8. Out-of-State: If you live in a state other than Georgia, then the probability of you appearing in Georgia on a traffic citation is likely not feasible. Therefore, many out-of-state drivers find it easier to just admit guilt to the Georgia Citation and pay the fine online. Do not allow convenience to ruin your driving record. In most cases, out-of-state drivers have an even greater risk of additional penalties by their home state. Let us help you; we appear in court on your behalf and fight hard to negotiate a lesser charge so that the violation is non-reporting. 9. 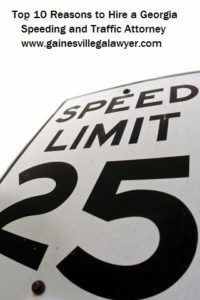 Super Speeder: Due to the addition to Georgia Law regarding high speeds on Georgia roads, it is a good idea to hire a Georgia Traffic Attorney to help obtain a reduction in speed. Otherwise, a driver not only faces fines resulting from the speeding ticket, but also an additional fine from the Department of Driver Services (DDS) of $200 for excessive speeds which include 75mph or more on a two-lane road or 85mph and above on any road or highway in the State of Georgia. 10. Reductions: Our local Northeast Georgia Speeding and Traffic Ticket lawyers are skilled, experienced professionals, which can help you navigate the legal system to get the best results for your case. We will fight hard to try to have a driver’s charges reduced to a non-reporting status. We will discover the best plea to help you maximize the best possible outcome for your case and help you protect your driving record. Additionally, we want to help you avoid harsh penalties and often times we can negotiate a fine reduction as well. Not every Speeding Citation requires an attorney, but some Traffic Tickets can have serious consequences. Please call us today. Please email us or call us at 770-783-5296 if you have been given a citation for a speeding ticket or traffic violation. Your initial consultation is free & confidential. Areas We Serve: In our experience, local knowledge is crucial to a Speeding Ticket or Traffic Violation Defense, so we are up front about the areas where we handle cases. To be effective, a Traffic Ticket Lawyer must be familiar with the court,the judges, and the prosecutors of your case. We believe we can best serve a client with any type of traffic violation in Hall County, Flowery Branch, Oakwood, Jackson County, and Helen. We have been there before and know what we are doing. ©2009-2017 A. Bishop Law, LLC. All Right Reserved.